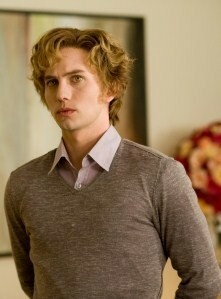 Description: Jasper is 6'3" and has golden honey blond hair. He is muscular but lean. Like the other Cullens, he has pale, marble-like skin and bruise-like purple shadows under his eyes, which appear gradually as his thirst increases. He has golden eyes, like all vegetarian vampires, which turn darker, eventually becoming black, as he grows thirstier. He has many crescent-shaped scars on his body, face, neck and jaw from the bites of vampires he fought on Maria's behalf. The white scars are invisible to humans unless contrasted by a strong light, but when viewed by a vampire they are said to be his most dominant feature, causing defensive reactions in vampires who don't know him. History: After becoming a major in the Confederate Army, Jasper was beset upon by the vampire Maria, who proceeded to turn him. After the transformation, Jasper aided Maria in her creation of a newborn vampire army which successfully conquered the feeding grounds of Texas. However, Jasper became tired of this violent and bloodlust life and eventually became a nomad. Fortunately, he was eventually found by Alice, the love of his life and with her began a life with the peaceful coven of the Cullen family. Jasper could be mistaken for cold because of his highly militaristic mindset. However, his relationship with Alice displays his warmer side. The fact that he suffered depression after his years in Maria's service suggests a strong sense of conscience and grief over his perceived wrong-doings. When he was human he was described as being extremely charismatic, and therefore very likable. He has also been shown to be a strong and forceful leader through his rapid ascent through the ranks of the Confederate Army. The fact that he is always a soothing presence shows that he wishes others to feel well and at ease, and will do his best to make that occur. Jasper is highly intuitive but also never takes advantage of his miraculous gift, showing that he is not malicious and chooses not to manipulate others. While the Cullens are gone in New Moon, Jasper studies philosophy at Cornell University. When the Cullens and Edward left, Jasper felt saddened when he read the emotions coming off Edward and how lonely and heartbroken he was without Bella. He voted "yes" for Bella to become a vampire. It was also partly because he did not want to feel the tendency to kill her all the time that he voted in her favor. He also believed that a newborn vampire's instability is natural and unavoidable, and therefore had lower expectations for himself and his control. However, when Bella demonstrates very high levels of self-control as a newborn, Jasper's ideas are challenged and he is forced to review his theories and raise his self-expectations.